To my old friends this looks familiar. Today Chari at Happy to Design is hosting Sunday Favorites. Our chance to rerun an old post. It has been raining here for days and days and days....so I need a good laugh. I was reminded of this post back in January. Thank you Chari for organizing this fun event. This morning I cleaned happily here by myself for hours. Drinking my coffee, listening to my music, and being followed by a big stinky dog. (Does that count as being alone?) I decided to give Katie a bath in my shower because it was 34 degrees outside and because I have promised myself that I would stop paying the groomer to do that job. Turned on the hot water. Tried to secure the double doors with a pony tail holder so she couldn't escape the bathroom - if she escaped the shower. Yes, it has happened. And whoever thought of bathroom doors with no lock? Coaxed and dragged her into the shower with the aide of the shower door pushing on her backside. Washed away with cucumber and watermelon shampoo. She loved this part and the Water Pik shower massage thingy really helps. She licks at the water the whole time. Meanwhile, I have no clothes on and I'm freezing because she gets all the hot water. Turned the water off and dried and dried and dried. She's shaking her big wet ears and water is flying! That's OK because we were still in the shower. You know how a dog can shake water off, don'tcha? Then, she pushed open the shower door...went skidding across my bathroom floor...shook again with all her wet dog might...then BURST through my rigged up double doors. Yes, I'm still naked in the shower. I figured at that point the damage was done so I would go ahead and do my thing. By the time I got out, Katie had travelled through just about every room in the house shaking and puddling water on my wood floor. I put her outside so I could get clothes on. By the time I got back (3 minutes later) she had rolled all around in the dry winter bermuda and was COVERED WITH DIRT AND GRASS. Yes, I was mad. I had to mop the floors and clean the bathroom. She sat outside the patio door looking at me like she had no clue. Eventually I let her back in. You know what a wet dog smells like, right? So much for thinking my house was gloriously clean! Well, your house DID get clean cause you got to do it ALL over again! I'll go over and welcome your friend Cindy. Hahahaha... I have small dogs, Cavaliers, but I sympathize. I once took extra care with one of them, till her coat gleamed with clean, and then let her out in the sun to dry, imagining her just calmly letting Nature's rays soak up the damp. Well of course she made a beeline to the dirt craters under the kids' swing set. I had the muddiest clean dog in New Jersey. And learned to keep dogs INSIDE till dry! hahaaaahhaaa...i remember this post and remember laughing myself silly....thanks for another giggle. I don't know when my dog smells worse before or after the bath. Plus I can't get the darned dog hair off my wet, cold body. This was hilarious. Thanks for the chuckles. Been there, done that....so cute. Thanks for visiting my garden today and the sweet note that you left there. I went by your friends too. Hello Stacey! So happy you found my Bloggie! Can you EVEN believe the Jury Duty Thingy? I have to REPORT to CONFINEMENT :) on the 16th of this month. ACK! I love your sweet blog and I will be back. You are one I'm going to definitely follow...I love your muse about your dog washing! I'd be MORE than happy to allow you the honor of washing my pooch! She is a 5lb. Yorkie who punishes me with her "bad attitude" for an entire day after having a scrub down. Blessings to you...so happy to have another local gal to share life's happenings with! I always knew there was a reason I like cats. That is so funny. I am sorry we really aren't laughing at you but with you. By the way I love the new header. Very very nice. Sorry I haven't been around lately. Things get a bit crazy for me in the Spring time with gardening, and all my son's Spring activities. Sorry girl! This is hilarious!!!! I'll try to stop by and say hello to your friend. Stacey, this is all tooo funny and all tooo familiar!! Oh I missed this one. How funny Stacey !! Bad Dog ! 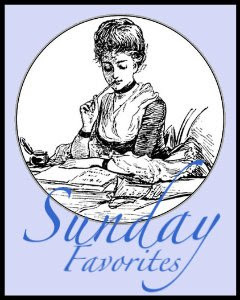 My friend, I'm so happy that you decided to join in with all the fun of "Sunday Favorites" again this week!!! I just love this post that you chose to share once again...it was new to me though! What a cute story...I guess enough time has passed that we can laugh now...right? hehe!!! Your Katie sure is a pretty girl...a bet it is quite the job to bathe her though!!! Your post sure brought a smile to my heart...thank for sharing it with all of us!!! Ooops...it's just lil' ol' me again. I just wanted to tell you that I'm heading over to Cindy's blog...thank you for introducing her! I want to go and give her a big bloggy welcome!!! I can just envision that scenario in my mind lol....they should make Febreze for dogs lol! Great blog! Maybe you weren't aware that Edmond has a Dog Wash in a former car wash on Broadway just North of 33rd Street (next to old WalMart location). Maybe THAT would help next time and her SHAKING could be done away from home. Also, I bet she couldn't get to any dirt or dry grass. Good Luck. Too darned funny! :) Yes, I was one that was considering saving the $40.00 for a groomer. Never mind! This story has cured me. Mine is small..but you can never be too careful! Think I'll stick to the groomer. Just thinking of all that thick long hair and she already fights me daily when I just BRUSH her. NO idea what she would do if I stuck her in a tub OR shower. What cute story that was! LOL! We have a Golden Retriever and he doesn't like baths at all. He always tries to escape! He loves being blow dryed though!